Still, the Browns — owners of just one victory over the previous two entire seasons combined — are a club that now matters, not just because they’re capable of winning, as they did 35-20 against the falling-apart Cincinnati Bengals on Sunday, but also because they have some real characters. There was more, too. When Browns safety Damarious Randall grabbed a pick in the first half, he ended up out of bounds on the Bengals’ sideline and handed the ball right to Jackson. Hmmmm. 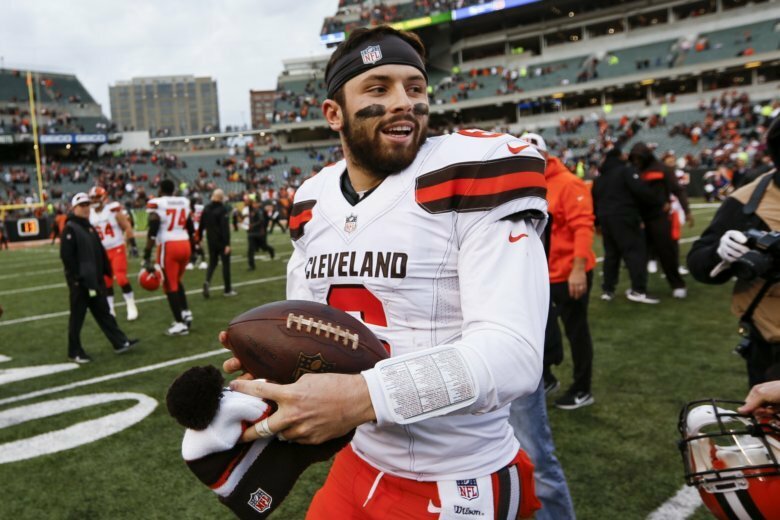 With Mayfield joined on offense by dynamic running back Nick Chubb — the fourth rookie in league history with rushing and receiving touchdowns in consecutive games — and young talent such as Myles Garrett and Denzel Ward on defense, plus the sort of swagger Randall showed, it looks as if the Browns might no longer provide the must-not-see-TV they’ve offered for quite some time. The most important takeaway from San Francisco 49ers linebacker Reuben Foster’s arrest on a domestic violence charge could be what, if anything, the NFL ends up doing about it. The 49ers said Sunday they’ll put Foster on waivers; spokesman Brian McCarthy said the league is reviewing the matter. He wasn’t exactly facing much of an opponent, but Chargers QB Philip Rivers sure turned in a performance to remember, completing 25 straight passes and finishing with a 96.6 completion percentage (connecting on 28 of 29 throws) — both single-game NFL records — to help LA top the Arizona Cardinals 45-10 and improve to 8-3. “It was a fun day, to say the least,” Rivers said. Give Indianapolis Colts coach Frank Reich credit for creative play designs, having Andrew Luck run pass routes in back-to-back games, including one that resulted in a 4-yard catch on fourth down to move the sticks on a TD drive in Sunday’s 27-24 victory over the Miami Dolphins. But, the coolness of Luck’s first career reception aside, someone also needs to remind Reich that his team’s success depends largely on Luck — and that the QB missed all of last season with a shoulder injury. So maybe it’s time to put those trick plays back in Reich’s pocket.